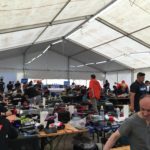 Our drivers compete in the European championships in Austria, a brief account of their actions. Day 1 (Thursday) weather forecast was not optimistic, but what was in place passed all expectations, downpour and huge puddles. The meeting of managers was to decide what we were doing. 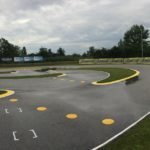 Trainings started normally, a few competitors prepared wet car and tried to ride a few laps, but with poor results, as seen in the photos below. One hour later it stopped raining. 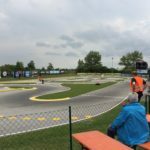 Starts the one controlled practise and the first qualification. Unfortunately, the lack of proper training did not allow finding setups, but the results were promising. Qualification day, luckily the weather is good … it’s dry😁. Patryk fights very strongly in the Formula class. 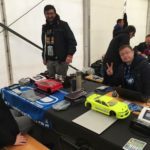 Blazej and Łukasz are fighting in the E10TC spec class, despite the fact that the competition is large and well prepared, he is getting better and better. The fight is very fierce in this class what Blazej found out in the 2nd qualification, in which he was interrupted by another player and lost several positions. Below are a few pictures, the atmosphere is great Łukasz, Blazej and Patryk give their best, good luck guys👍 !! !